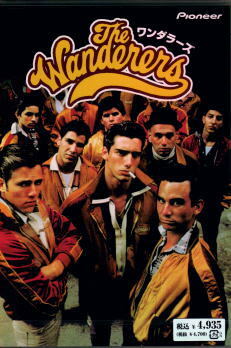 With a joyous soundtrack featuring Dion and Frankie Valli, The Wanderers is among the finest of teen gang films. Set in the Bronx of 1963, Italian-American kid Richie (Ken Wahl) and his friends (Tony Ganios, John Friedrich) form their own greaser tribes and get in turf wars with other outlandish gangs like the Fordham Baldies. Bob Dylan is lighting up Greenwich Village, but Richie and company are in the next borough over -- and they might as well be on another planet. When Richie meets Nina (Karen Allen), he is drawn into the culture clash of the oncoming sixties. Warm and funny, The Wanderers moves through a pivotal loss of American innocence -where nostalgia is laced with a sharp hint of melancholy. The Wanderers is, of course, an adaptation of Richard Price’s novel of the same name. It’s been said that you struggled to get an option on the book - why the discouragement? Kaufman: It was really only once my wife and I spent a lot of time adapting the screenplay. The book was actually discovered by my son Peter who was 11 or 12 at the time, and he said, ‘Why don’t you guys make a movie of this?’ But once the screenplay was there and we started taking it around to studios — it was another time and an another era. The studios were saying, very authoritatively, there’s no market for teenage movies. […] And they were saying in America nobody goes to movies in the summertime. Everything has changed so much. They just were at a point where, aside from American Graffiti, which they viewed as a freak event, they were interested in other kinds of films. We got rejected time and time again, but we just kept pushing on until we found somebody who would take it on. Looking back now, teen gang films seem to have had a real vogue in the ‘70s and early ‘80s. American Graffiti, Boulevard Nights, even The Warriors, though it’s set in contemporary times. Later, Coppola did two S.E. Hinton adaptations with Rumble Fish and The Outsiders. What do you think attracted so many filmmakers to the material? Kaufman: I don’t know if there was a vogue. It was sort of, we were ahead of the vogue. We were developing The Wanderers for a number of years, and The Warriors was not yet being made - I knew Walter Hill and he was working on other things. He asked me what I was doing and I told him I was trying to make The Wanderers, and then that came into being mostly afterwards. Boulevard Nights was quickly put out, we had a problem we had when those movies were rushed into release before The Wanderers came out. Both of those movies incited violence - or violence happened in the theatres. As a consequence, The Wanderers — which came out shortly after that — couldn’t get into a lot of theatres. Coppola did his movies later, and Barry Levinson, who I had been talking to, was just starting to make films — he made the film Diner a few years later - and I think it was perhaps influenced by the tone of The Wanderers. But it’s hard for me to say, when you look back you can say these movies appeared around the same time, but I don’t know that there was a real vogue when we put The Wanderers together. It was sort of a one-off type of movie. And George Lucas’ version of coming of age in Graffiti was quite different to coming-of-age in The Wanderers. He wasn’t familiar with the tough greaser — he didn’t even know that guys who were tough New York greasers were also athletes. He had a very different version because he came from Modesto, California. The film, following on from Price’s novel, is set between ’62 and ’63, and JFK’s assassination features prominently. It’s an event often referred to as the real end to the 1950’s. What was the importance for you in capturing this change in mood, and what it means for Richie and the boys? I mean, we all grow up and we all in some ways wish we weren’t growing up - which is somehow linked to nostalgia, and we remember the good things perhaps out of proportion — but the bad things too. Our adolescence is a very vivid time. So maybe we were coming of age and beginning to think back to that. When Peter showed us the book, we put things together in a way that could both include my adolescence, my wife’s, and Richard Price’s. 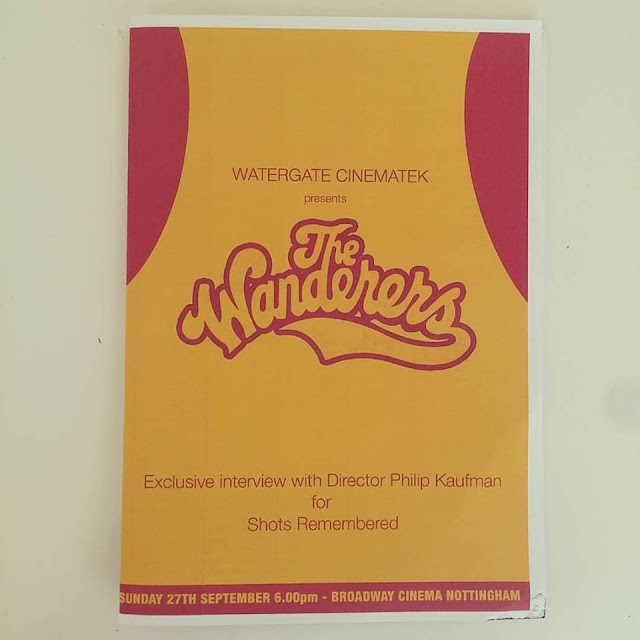 The Wanderers is a series of short stories, so we blended a number of stories into one narrative and again, you know, put in events that I experienced. Centering it around ’62, ’63 — really, the Kennedy assassination — began to define the boundaries of what that era was about. So it was an era of personal reminiscence. I actually grew up a little bit before that time, but I would put The Wanderers into that time as being a sort of end of that period. And the Kennedy assassination, in broad strokes, is not only the end of that period, but the beginning of another kind of turbulent political period that begins to move into hippie times and anti-war sentiment — things change, and that era in the early sixties is pretty much gone. It’s interesting that there was something like an overlap in the early sixties between these two cultures — the dominant one and the growing counterculture — and how that gap grew. But these boys who are quite young at the beginning of the sixties still so clearly belong to a different world. It was a strange time. When I was shooting my first feature, it was in 1963 - a small film called Goldstein. We were shooting in Chicago and we came out from lunch with a small crew and camera. It was probably three or four men and a couple of actors — and we were on this boulevard. Suddenly people are coming by crying and teary-eyed. We followed them and moved into this store with all these TV’s on, and there was the Kennedy assassination. That was something I sort of tried to replicate in the film with Richie — that same mood and feeling -- the tragedy. Music, politics, everything was altered in that moment. 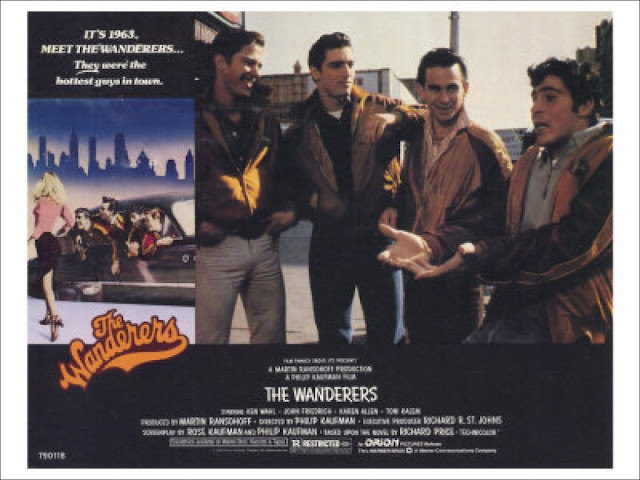 It seems to me that The Wanderers is much more grounded in a kind of reality than other ‘nostalgia’ films - with abusive or absent parents, etc. Yet other scenes almost feel fantastical, as with the battle on the football field. Were you conscious of striking a balance between realism and more fantastical elements? Reality is a funny thing, because when you’re younger and smaller you look at the world from a different perspective. Comic books seem totally fantastical, but for younger kids there’s a certain reality in them. With the Fordham Baldies — when you’re small, and you look at big tough guys in the neighborhood, they seem so much more monstrous and gigantic then you later realize they were when you've grown up. […] So I wanted to get that sort of perspective, which is sort of reality, but is sort of — is the truth factual or is it just the way in which we experience things? You cast Ken Wahl as Richie and Tony Ganios as Perry — and plenty of the others were either unknowns or first-time actors. You’d worked with Hollywood actors like Warren Oates and Donald Sutherland prior to that, so what decision-making was behind your casting choices? You try to cast the right actors. This was meant to be something without stars — I can’t think of a star who would have been right to be in the movie. We did make an approach to the manager of a young up and coming singer/rock star - a guy named Bruce Springsteen - who could have played Richie. But he was busy doing concerts, so that ended that. Springsteen was a type of guy who could have played Richie. But these guys who were cast - most of them had no acting experience at all. Ken Wahl was trying to be an actor and hadn’t done anything yet. I was shown a photo of him and I liked it. We called someone in LA to fly him out to New York where we were shooting the movie, and when he got the call he was on the way to his job in a pizza parlor. The music in the film, from Dion to Frankie Valli and the Four Seasons, is so memorable. How did you go about choosing the soundtrack for The Wanderers? I must say Richard Price was a big help with that. Richard was a total expert and fanatic about the music of the time, and he would send me these little recordings of all of his favourite songs. But we spent a lot of time laying in that music over the scenes and it permeated the experience of that time. It was just perfect. I still occasionally listen to that music, and in some ways there’s none better. That music was so great, and you know, maybe it’s because my time in that world has passed a little bit […] I wonder if the music of today is nearly as good as the music of that time. And then you use Dylan very cleverly as a signpost of a different kind of time and a different kind of music. That wasn’t in the book. I knew Dylan, I’d been working on a project that was never made with him. So he gave us the right to use The Times They Are A-Changin’ and that to me, along with the Kennedy thing, was another signpost. If Richie had followed Nina (Karen Allen) into Folk City snd sat with her, he might have gone on to another — I hate to say it — more civilized existence. His music is Dion and her music is Dylan. Dylan, The Beatles, and the Rolling Stones made anthems for another generation, and that generation displayed their affiliation with music in quite different ways, with Woodstock, etc. The earlier culture around the Four Seasons and Dion was riding in cars and dancing in basements. We had this thing happen at the Telluride Film Festival […] I’ve been up there a number of times, and my wife Rose and I went up many years ago. We were standing in a square and suddenly 30 people in Wanderers jackets came running out to surround us. Everybody who was working at the festival had made their own jackets —and they were all Wanderers — they knew every line in the movie. And I’ve been back a few times — and they keep the tradition of the Wanderers alive, up there in the mountains. And I had no idea! I’ve got some of the original jackets — a guy named Bob Demora, was a great costume designer. They really are beautiful jackets with great colors and a couple of times i’ve gone up to Telluride with the original jackets and stood on corners and everybody marvels at them. Who or what would you consider to be your greatest influence? We screened a lot of Fellini at that time. Amarcord, I Vitelloni — another coming of age movie — both have a magical quality. And going back to your earlier question about some of the American movies coming out at that time, I think you could then go back to Fellini and that sort of coming-of-age that some of the Europeans were doing which was influential. Pasolini made a film I saw living in Europe called Accattone, Truffaut had done The 400 Blows, and when you start looking at Shoot the Piano Player and Jules + Jim, there’s a kind of playfulness with the narrative. A certain kind of romp where the characters are having fun, but underneath there’s tragedy — or tragic elements. So I’d say that a lot of the influences that I had, and certainly I think my contemporaries in America had, came out of sort of the playful European New Wave. In England of course there was more of the kitchen sink drama, which was important, with great acting, but they were anchored in a sobriety that wasn’t coming out of this New Wave. I would say that that was maybe the most influential — the freedom of the New Wave. You get the sense that the boys are on the cusp of a big change. Do you ever think about what might have happened to them afterward? Well, that’s it — Richie’s fate is sort of sealed. I don’t know if you’ve seen The Sopranos […] I get the feeling that the Richie character would end up like one of the Sopranos. That’s sort of prefigured when he goes back and gets one of those Hawaiian shirts and Chubby Galasso says ‘You’ll grow into it’, meaning he’s going to become a big fat tough guy — living that life. Whereas Joey and Perry go off on an adventure - in the longer version, (the directors cut) there was a more of a suggestion that there was kind of innocent sexuality between the two them, heading out to San Francisco. It’s hard to say what their fates would be. I did a film called Rising Sun with Sean Connery, and I used Tony Ganios (who plays Perry) as a guy who was a bodyguard for a gangster. I felt that was what had happened to Perry - years later he took odd jobs. I even had Tony Ganios have a toothpick in his mouth, like Perry does when you first meet him. And Tony said to me, ‘Hey Phil, do you mind if I had a matchstick with a different color at the end, so I’m not the same guy exactly?’ In my literature, that was what happened to Perry many years later, after he left The Bronx. Thanks for talking to us, Phil. Anything you’d like to share with the audience for our screening? Well, we are trying to get an American company — the rights have been so complicated — one company passed on to another. But there’s a company who’s now trying to release the blu-ray in America. I have such a fond spot in my heart for this movie. It’s not only what it says about those times, but my time of making it with all these then-young guys. You know, it was such a great time.